The need for inspection methods to assess the conditions of,the stay cables of bridges has recently increased due to owners concern about the operability and safety of such aging structures. Fig 1: NDE equipment for the inspection of large diameter (Æ >100mm) steel cables. 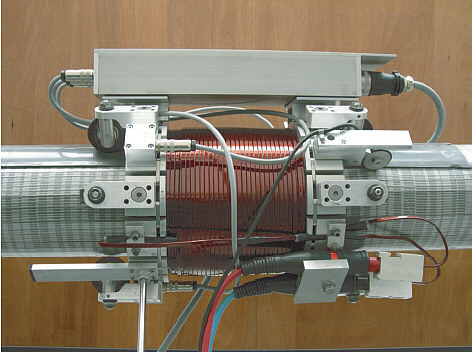 The Magnetic flux LEAKAGE (MFL) method is widely used for the assessment of the condition of off-shore and aerial tramway cables in Switzerland as well as in other countries.EMPAdeveloped a device for the nondestructive evalution of large diameter cables (see Fig.1) and uses it since summer 2001 for laboratory and on site tests. Equation (1) describes a dipole field that approximated the magnetic leakage field of a flaw at a (r) from a sensor. Fig 2: Schematic representation of the MFL generated by a flaw (bottom) and shape of the recorded signal (top). Fig 4: Overview of measured signal (top) and detail of signal from flaw(bottom). The inspectionof the cables of RAMA IX Bridge in Bangkok yielded considerable amounts of data (approximately 2GB for 68 cables with 121mm<f< 167mm) that had to be evaluatedmanually by viewing the data plots. Fig 3: Longitudnal section of the RAMA IX Bridge in Bangkok, Thailand. Based on the experience gathered it is considered that the automatization of the task would offer great advantages, both froman economic point of view as well as in terms of reliability. In order to automate the detection of flaws based on the recorded MFL signal reliable methods to recognize features indicating a flaw from a noisy background are necessary. Simple threshold criteria are generally not sufficient to distinguish a peak due to a flaw from an intensive noise spike. Fig 5: Measured MFL signla (red dots) and fitted approximation (green curve). As an alternative to the threshold approach, a feature extraction method based on an analytical description of the signal, coupled with neural network discriminator is proposed. A relation for the general shape of the MFL SIGNAL IS DERIVED FROM (1) AND Fitted to the measured signal. The fit parameters obtained through this procedure contain the most significant information. The quality of the best possible fit is a measure of how well the measured signal corresponds to the physical model selected for the feature extraction. Data from real measurements, including flaws,noise and artificially introduced `false alerts` in form of sharp spikes of different width were used to train and test a panel of 100 neural networks,all with the same architecture. Approximately 25% of the signals were used for training and the remaining 75% for verification of performance of the panel of networks. Fig 6: Comparision of network prediction ( ) and actual output ( ) for 53 processed signals. : unprocessed NN output. .
For the case presented here the panel showed a 3.8% error level(two misclassifications on 53 prediction) Further work is currently being performed to increase the accuracy of the prediction, by using 2-dimensional field maps. Also,new appoaches are being tested for the analysis of normalized data. This step would lead to system-independent calssification of flaws. C.B. Yun "Damage estimation method using committe of neural network" SPIE'S 8TH Annual international symposium on NDE for Health monitoring and Diagnostics, 2003 to be published.